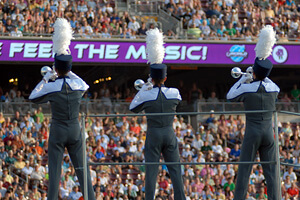 With fans still remembering the severe weather delays that ultimately rained out the inaugural event in 2010, 24 corps appeared in Minneapolis on Saturday, July 16 for Drum Corps International's 2011 DCI Minnesota competition. Topping a field of 18 World Class corps, the Cavaliers took first place at the University of Minnesota's TCF Bank Stadium with a season-best 87.35. "I felt it was very big win tonight for us, coming in here with this great stadium and a great audience," said Cavaliers Director Adolph DeGrauwe. "It was the first time we've seen these corps in quite awhile, and it was great to make a statement with so much competition coming on." The Cavaliers' finish in Minneapolis is a remarkable jump from its last competition on July 12 in Waukee, Iowa, where they scored 83.95. 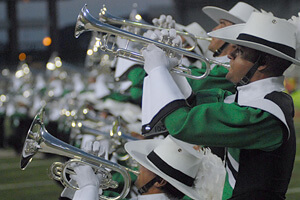 Though the corps has been riding the wave of an undefeated streak since the second event of the 2011 season in June, the 2010 silver-medalists are more than aware that the corps just below them can make huge strides before the end of the season. "We're definitely worried [about the competition]," said DeGrauwe. "We don't feel comfortable that we're locked in at this point. Look at last year how we moved up into second place at the end of the season. We still have a lot of things that we're working on, and we cannot sit back and wait for [other corps] to catch us." In the Green Machine's rear-view mirror is a tight group of corps within a half a point of each other. Carolina Crown (2nd, 85.95) edged the Blue Devils (3rd, 85.90) by a razor thin margin of half a tenth, with the Cadets coming in fourth place at 85.55. Jim Coates, Carolina Crown Executive Director, said that Saturday night was the first time his corps took the wraps off a new ending to its production titled "Rach Star." "I thought the crowd reacted well to it," Coates said. "[Competitively], I'm ecstatic where we are right now. The kids are great performers and they're performing well. We know as a design team where we're going to take this thing, but we still have a lot of work to do. Four more weeks left this season, and it's a wonderful place to be." Just two tenths separated fifth and sixth place, with Phantom Regiment scoring 83.10 to the Bluecoats' 82.90. Santa Clara Vanguard was the only other corps to break 80 at the Minneapolis event scoring 80.85, which was good for seventh place. A little less than a point and a half separated the Madison Scouts (8th, 79.85), Boston Crusaders (9th, 79.40), Blue Stars (10th, 78.85) and Blue Knights (11th, 78.50). Boston's 79.40 was a 2.2 point improvement over its score on July 13 in Sioux Falls, S.D., where they finished fourth behind the Blue Knights. "We're working really hard, and we've made huge improvements since the pre-season," said first-year Boston Crusaders bass drummer Karama Sharma. With a huge lineup in Minnesota, for Sharma, it was exciting to be up against so many other groups. "I'm definitely looking forward to more regionals like this," he said. The battle for the coveted 12th spot at the World Championship Finals looks to be up for grabs with a month to go on the summer tour. 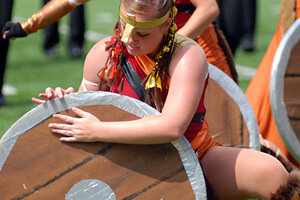 Troopers' 12th place finish in Minneapolis (74.70) was a mere .25 from Spirit of Atlanta (13th, 74.45) followed by the Glassmen (14th, 74.30). Colts (15th, 73.25) finished ahead of the Crossmen (16th, 72.85), Teal Sound (17th, 69.65) and Cascades (18th, 66.75). 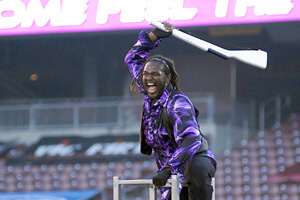 Crossmen's 2011 production "Renewal" is one that drum major Justin Hawkins says is made to be a hit with crowds no matter what place the corps is in. "I guess our approach is just to jam," Hawkins said. "We're trying to go out and focus on the crowd … take a hands off approach to the scores and concentrate on having fun." Kicking off the nine-hour Minneapolis drum corps marathon were four Open Class groups. Legends took first place with a score of 66.75. 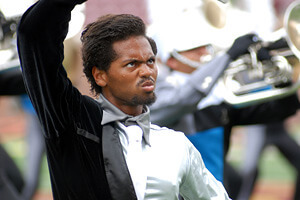 The Kalamazoo corps' 2011 production "Skyscapes" is one that Michael Unsworth, a sixth-year member of the brass section, says has nowhere to go but up.